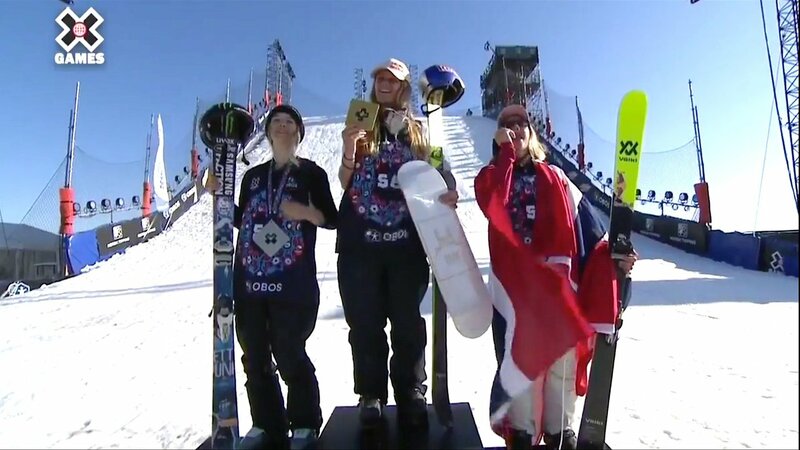 The finals on the ski side of X Games Norway kicked off today with Women's Big Air. A field of 7 ladies took to the sunny skies above Oslo courtesy of a striking scaffolding behemoth. With Big Air as the only ski event and no qualifying on the women's side, everything came down to 3 jumps deciding who took home medals. The format, which required two different spin directions (from left, right, switch right, switch left), rather than the spinning both ways as at Aspen, played a role again today. Ultimately Giulia Tanno did the best trick of the day with a left dub 10 safety, but her backup trick, a switch 5 safety on her final hit, fell short. As a result, Jennie-Lee Burmansson, sporting a fresh Red Bull sponsorship, took the win courtesy of a super smooth switch left 7 tail to tweak safety and a switch right 7 safety. Jennie-Lee Burmansson - Switch right 7 safety, switch left 7 blunt to tweaked safety (stomped). Dominque Ohaco: Left cork 7 safety, switch left 9 mute. Sarah Hoefflin - Sw left cork 5, switch right 7 high mute. A full replay event is coming soon on the X Games YouTube Account.